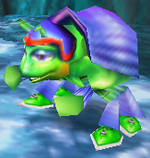 The Beetle is a large, green beetle in purple racing gear. She seems to be good friends with the Kongs. In Donkey Kong 64, she challenged two of the Kongs to races, rewarding each with a Golden Banana upon her defeat. In Angry Aztec, she challenged Tiny Kong to a race down a large slide, where Tiny had to get at least 50 DK Coins and finish first to win, which she managed to do. She returned later, in Crystal Caves, to challenge Lanky Kong to a race under the same conditions Tiny was put under. Using the Orangstand Sprint from Cranky, Lanky also managed to best the Beetle. This page was last edited on September 20, 2018, at 17:27.